You are at:Home»Herbs»Chlorophytum arundinaceum Baker. Description : Safed Musli, one of the finest Indian herbs, is a traditional medicinal plant. 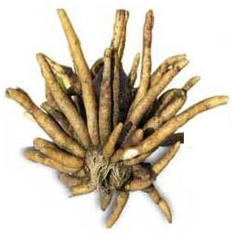 Its tuberous roots are used to prepare herbal products and Herbal medicines, especially a nutritive tonic used for curing general sexual weakness. It is a rich source of over 25 alkaloids, vitamins, minerals, proteins, carbohydrates, steroid and polysaccharides. Recommended Dosage : 5 to 10 g powder.